Chamber of Commerce Student of the Month Emily Rich with Brian Ebersole of Consolidated Electric. Chamber of Commerce Student of the Month Molly Brooke with Brian Ebersole of Consolidated Electric. MOUNT GILEAD — Two local students were honored last week for their outstanding achievements. Molly Brooke was presented with the Consolidated Electric and Morrow County Chamber of Commerce February Student of the Month Award by Brian Ebersole of Consolidated. He mentioned Brooke’s many accomplishments and honors in four years at Mount Gilead High School. Mount Gilead High School Senior, Brooke received honors and accolades in many areas. She has achieved high honors in academics and was Vice President of National Honor Society her junior year and is President this year. She has a 4.03 cumulative grade point average and is ranked fourth in her class of 86. She is senior class treasurer, a member of Key Club and President of Pep Club this year. She has been in musicals and plays all four years of high school. Show Choir is a favorite activity all four years of high school and this year she helped choreograph for both show choir and women’s show choir. In choir contest she ranked 1 at districts and 2 at state contest in her senior year. Community work has been important for Brooke. She participates in Red Cross blood drives, Pizzaburg fundraisers, trash clean up, missions to Mexico, installing smoke detectors for the fire station, working at the fair and selling Christmas trees for Lions club. Molly’s parents are Brandy Brewer and Jason Brooke. Ebersole had special enjoyment in presenting the Student of the Month award to Emily Rich because her father Matt Rich is an employee of Consolidated Electric Cooperative. 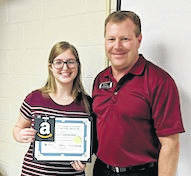 Gilead Christian School Director Bryan Potteiger reported on the reason Emily was nominated as Chamber of Commerce February Student of the Month. Rich has been a member of the Ohio Scholars Association her junior and senior years and is president. She has been Student Council Vice President in her junior and senior years. She has taken two mission trips to Ciudad Juarez, Mexico, with classmates. This experience helped her decision to major in Spanish Education. “At the forefront of her nomination is her love of mission work that represents her love for Christ,” Potteiger said. Rich plans to attend the Ohio State University and major in Spanish Education. Her parents are Mindy Cole and Matt Rich. Consolidated Electric Cooperative is the sponsor for the Student of the Month awards each month for all Morrow County high schools. https://www.morrowcountysentinel.com/wp-content/uploads/sites/29/2018/02/web1_emilyrich.jpgChamber of Commerce Student of the Month Emily Rich with Brian Ebersole of Consolidated Electric. 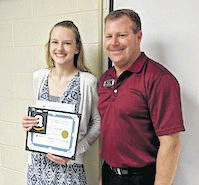 https://www.morrowcountysentinel.com/wp-content/uploads/sites/29/2018/02/web1_MollyBrooke.jpgChamber of Commerce Student of the Month Molly Brooke with Brian Ebersole of Consolidated Electric.